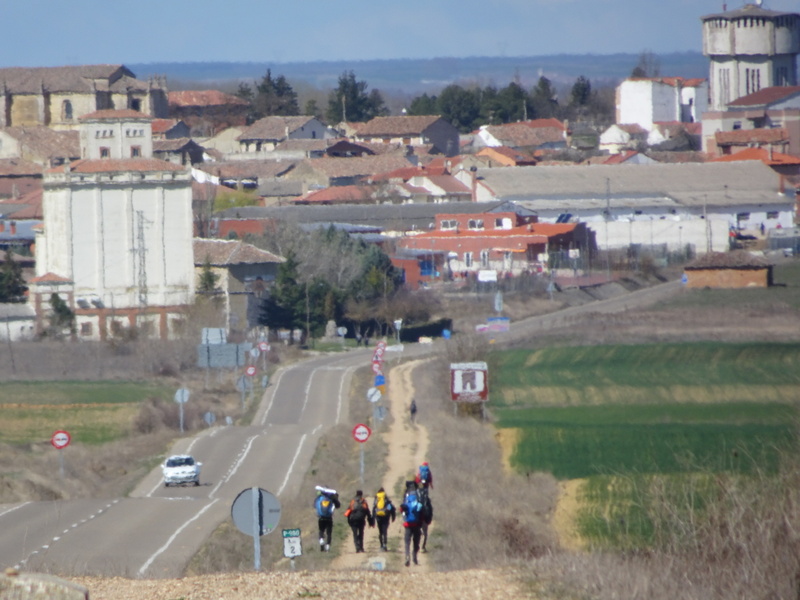 Arrow straight roads, ancient paths built by Romans, old tractor tracks, highway shoulders, anything to move the Camino forward across the flatlands. Pilgrims turn into hazy specks in the distance, disappearing into shaded town squares to rest by water fountains, reappearing again under the open sky to follow the dusty yellow arrows west. The wind is fierce. Dust kicks up off the dirt roads. The sun burns, even in winter, enough that a nun stops me on the street and warns me to be careful, that this is the Castilian sun, not the weak sun of the north. The unchanging landscape stretches the miles, making them feel long, giving my mind nothing to distract it from itself. Weariness creeps up on me at the end of days when I sit down. I don’t expect it, not with these low miles, these flat paths, but it’s there, burnt in by the sun, by the hard, unchanging tracks, by the thirst that builds between towns. A thin line of mountains materializes on the third day, ripples across the northern horizon, a white-capped edge to the flatness, a reminder that if I keep going, I will reach the end. It is a truth I know in my heart without seeing the mountains, but my eyes relish the confirmation. León waits out there somewhere. Close. I feel it in the roads, in the towns getting bigger, in the traffic signs as I pass. Tomorrow, I tell myself. One more flat day under the Castilian sun, then the earth will begin to ripple again. Listen to the nun! Buen Camino even on the flats! Once again your mental and physical toughness will get you through this challenging segment of your journey. Namaste. “My heart dwells in the mountains” someone said that, can’t remember who but it came to mind when I read your post. Thinking of you. Be careful. If you don’t follow the nun’s warning the next nun is going to hit you with a ruler. Been there. D. Carriòn is my last name. My people are from Spain 🇪🇸. Can’t wait to see you when you get back.